"On your marks, get set, go!" Who could fail to remember the exciting television pictures of the fastest legs in the world belting past on the Tartan track of the Olympic stadium at Sydney 2000? Appearing almost within touching distance, the accompanying high-speed running and jumping event cameras supplied us with a new dimension of pictures right into our lounge. It was with astonishment that we looked down on the pole-vaulter from above, swam alongside the leading competitor in the swimming pool and enjoyed the remarkable new sensation of actually seeing the drops of sweat on the face of the leading long-distance runner. All this has been made possible by a camera control system which was tested for the first time at the 1992 Olympic Games in Barcelona and which has been perfected even further during each and every Olympic summer and winter games since then. At the British Formula 1 Grand Prix the camera moved alongside Michael Schumacher's Ferrari in the pits, recorded the "thwack“ of the yellow balls at Wimbledon and followed the sensational stage show of Madonna. A major contribution in the development of the drive and control system of this camera was made by Transmission Developments, the English member of the MULCO EWIV Group of Companies. This system can best be imagined as a short railway line on which the gyro-stabilised TV camera, weighing 125 kg including frame, is accelerated and braked in a UFO-type special housing by remote control, reaching acceleration speeds of up to 8m/s². The constant speed during uniform movement is in the region of 14m/s, while the driving servomotor has a torque of 80 Nm. Transferring these forces is the task of the PU timing belts which, thanks to their almost ideal characteristics, were chosen in preference to chain drives. Apart from the torque transfers, it was not only the enormous lengths of the timing belts, measuring in excess of 200 m for a 100 m track and the final bend which had to be taken into account, but also the many other influences such as dust and moisture from the jumping pits and tracks. It goes without saying that absolutely uniform and smooth running as well as gentle movements of the camera have to be guaranteed. Shaky pictures would certainly spoil the pleasure of the viewing public, while the environmental influences should not be underestimated either, as dust and sand from the jumping pits will turn into a thick brew when it rains. Even the preparations for "Operation Sydney“ make impressive reading. Five months were required for the design, construction and dispatch of the 8 systems used during the Olympic games. 16.5 t of equipment, packed in four large sea-freight containers, were flown around the globe to the land of the kangaroos by Boeing 747, where 16 specialists took over the construction. By this stage a number of development stages and test runs with PU timing belts from the MULCO EWIV member BRECO had already been carried out at Transmission Developments, ultimately resulting in the 20 AT10 belts for the straight and final track as well as 25 AT10 belts for the last 100 m of the straight. 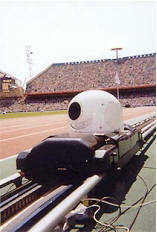 During the Olympic year of 2002 the moving cameras and other locations supplied exciting pictures of competing athletes on the long-distance track or in the ice oval at Salt Lake City, as well as at the Commonwealth Games. We can therefore look forward to continuing to receive fascinating television pictures achieved by the convincing know-how of the MULCO EWIV Group of Companies, which celebrated its 50-year anniversary in 2001.